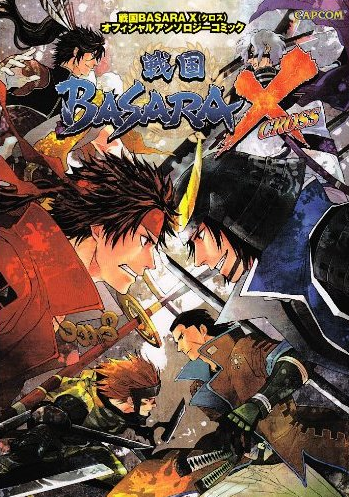 Today's manga review covers Sengoku Basara X (Cross) Official Anthology Comic, a manga anthology released way back on 13th September 2008. It's 112 pages long and priced at ¥950. Unlike most of the newer books, this one was published in-house by Capcom and is now long out of print. Used copies can be found cheaply at sites like Amazon Japan, and individual bookstores might still have old stock on their shelves. With this being based on the PS2 beat 'em up game rather than the main series, the stories are arranged around one-on-one fights without any attempt to incorporate a coherent plot. Sadly, there are no extras or colour pages at all aside from the lovely cover drawn by Nari. One thing that a collector will swiftly realise is that a great deal of the contributing artists are also regulars from the Gakuen Basara series. This means that as well as similarities in the artwork, the stories tend to be crazy too. I've written very brief summaries of each individual manga below. Masamune mocks Yukimura mercilessly as he struggles to learn how to use the new button inputs to perform moves in the game (Masamune's useless explanations are no help at all). Fortunately for Yukimura, it doesn't take long for Sasuke and Oyakata-sama to turn up and try to help him out. Motonari and Motochika face off as usual, Motonari with his army of sacrificial pawns and Motochika with...a Niou statue adapted to resemble Motonari. The pawns become very confused by this tactic and the two commanders end up having to fight one another without any support from their armies. Hideyoshi and Hanbee are fascinated by Tadakatsu, and end up trying to rescue Takechiyo with him. However, poor Takechiyo is just too tempting for the nation's various kidnappers to resist! The Toyotomi duo act a little like a pair of cartoon villains in this comical story. Locked in a gruelling fight, Nobunaga and Masamune both summon their respective supporters. Unfortunately, it seems that Kojuurou, Nouhime and Ranmaru are so worried about their masters that they keep getting sidetracked on the way. Will they even be able to arrive at the battleground in time to offer their assistance? The Azai couple are fighting Hideyoshi and Hanbee - though it's been more like a war of words so far. Oichi seems more afraid of upsetting Nagamasa than of the hulking conqueror in front of her, and Nagamasa is powerless against Hanbee's jibes. This chapter was cute and reminded me what perfect teams both of these pairs make. Motonari's army of sacrificial pawns gets a second moment in the spotlight as Kojuurou tries to understand why they willingly obey a master who cares so little about them in return. There are a couple of 4-koma comedy strips at the end which enhance the humour. I love Nishizawa's artwork. Kenshin and Hanbee are locked in a savage battle, and yet their allies Kasuga and Hideyoshi cannot stop arguing about which of the two is the most graceful. Their blind faith in their comrades' beauty makes this a very funny chapter to read - especially in Hideyoshi's case. Keiji charges into a good-natured clash with Kenshin and suggests a festival, all the while driving Kasuga crazy with every single thing he does. Kenshin keeps driving her crazy too, in a different way. Oichi comes face to face with her terrifying brother to try to improve things between him and her husband Nagamasa. As expected, things don't work out - and people start to die. Kyunkichi portrays Oichi at her creepiest. Yukimura misinterprets Oyakata-sama's disapproving frown and spirals into a deep depression after being tricked by a sneak attack from Keiji. Sasuke has to watch over him as he heads out for revenge - and Keiji has walked into some trouble of his own. The final story pits Kojuurou against Hanbee in a test of teamwork as both wait for their lords to turn up and seal their victory. Sadly, the trust that Masamune has in Kojuurou runs so deep that he dawdles on the way to the the battleground. What will happen to the loyal Right Eye of the Dragon when Hideyoshi arrives on the scene? Due to the number of strips in this slim anthology, each is extremely short. This prevents any of them being able to aspire to being more than a few cool battle scenes and a punchline, though the creators do their best with the limited page count. Often-overlooked characters such as Ieyasu (Takechiyo) and Hideyoshi get a very respectable amount of focus and none of the Sengoku Basara X (Cross) leads feel as though they've been pushed into the background. I can't really recommend tracking down this old book now that the newer anthologies are both thicker and easier to purchase, but if you happen to have a chance to pick it up it's an entertaining read. With Hideyoshi, Hanbee and Nagamasa having rejoined the main cast in Sengoku Basara 4, it's interesting to look back on their earlier appearances once more from a fresh perspective. Fans of the pool of manga artists who contribute to the Gakuen Basara series might also enjoy seeing additional work from them using the game series' original setting.